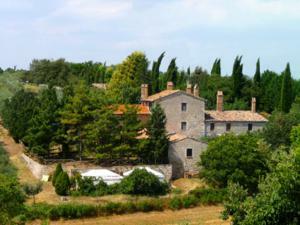 Campodoro is a B&B in Umbria to be found near Todi immersed in the countryside, just 10 kilometers from the town. Many other famous Umbrian cities are just a stone throw away. The land around the B&B is one hectare and includes this truthfully Umbrian stone-wall farmhouse that was entirely restored a few years ago. Shops and services are nearby in the medieval towns located a short distance away. Here you will feel the precious advantage of a land where time paces slowly, life is gently passing by day by day and people is welcoming. The owners and the staff are fluent in both French and English. Using their extensive knowledge of Umbria, the owners will aid you design your day by day sightseeing excursions in what is widely known like the Heart of Italy. This bed and breakfast in Umbria is fully enclosed and supplies sufficient exclusive parking. A swimming pool also thrones in panoramic position. At Campodoro B&B there are two kinds of stay you can choose from: apartments and double rooms with matrimonial beds. Each includes an entrance facing the backyard. For your peaceful moments, a private outdoor sitting corner is also provided. All rooms have an ensuite bathroom with shower. Among other services and amenities, you will also find a hairdryer, an electric kettle for hot beverages preparation and a TV with satellite channels. On the other hand, apartments are composed of a living/dining room with equipped kitchen. Barbecue, laundry facilities and DSL Internet services are available property-wide. For breakfast you will get homemade bread, all coffee shop hot beverages, fruit juices, eggs, cereals, yogurt and homemade preserves. The woodlands near the property offer great grounds for hiking. Likely are the many nature sports that can be enjoyed in the Valnerina, such as para-gliding, canoing and many others adapted to both children and amateurs. During certain periods of the year hot air balloon rides are also a great option to discover Umbria from the sky!